A hurricane warning has been issued for the Gulf Coast of Florida from the Alabama/Florida border eastward to the Suwannee River. The strengthening storm is expected to head north across the Gulf of Mexico before making landfall on Wednesday. Hurricane Michael is expected to hit the Florida Panhandle on Wednesday, after strengthening in the Gulf of Mexico. Hurricane Michael is expected to strengthen rapidly over the next 24 to 36 hours and will be "a dangerous major hurricane when it reaches the northeastern Gulf Coast on Wednesday," the National Hurricane Center says. The storm achieved hurricane status with maximum sustained winds of 75 mph Monday morning, triggering warnings of a life-threatening storm surge that could hit the Florida Gulf Coast. Later in the day, its sustained winds topped 90 mph, with stronger gusts. Florida Gov. Rick Scott issued a state of emergency for 26 counties on Sunday, as member station WFSU reports. The governor warned people who live in the Big Bend and Florida Panhandle to prepare for flooding and high winds. Emergency management officials in Tallahassee and Leon County also began distributing sandbags to residents. Hurricane Michael was about 485 miles south of Panama City, Fla., at 11 p.m. ET Monday, the National Weather Service said, and was moving north at 12 mph. 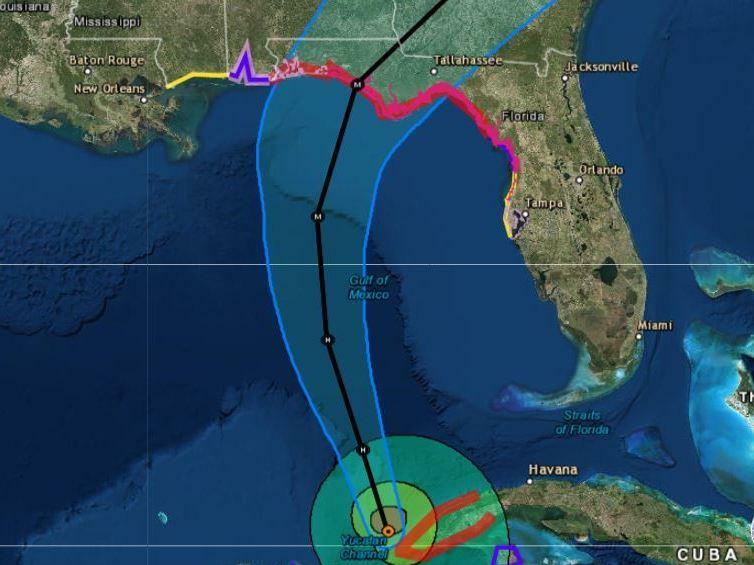 A hurricane warning — meaning hurricane conditions are possible within 36 hours — is in effect from the Alabama-Florida border to the Suwannee River in Florida, the National Hurricane Center said. "Start preparing today," NHC Director Ken Graham told people in the storm's path, in a Facebook video update Monday. "You have some time tomorrow, but [as] you start looking at tomorrow night into Wednesday, things start to deteriorate rapidly." Michael brought heavy rainfall and hurricane-force winds to western Cuba on Monday, with its center brushing close to the island as the storm headed into the Gulf of Mexico. 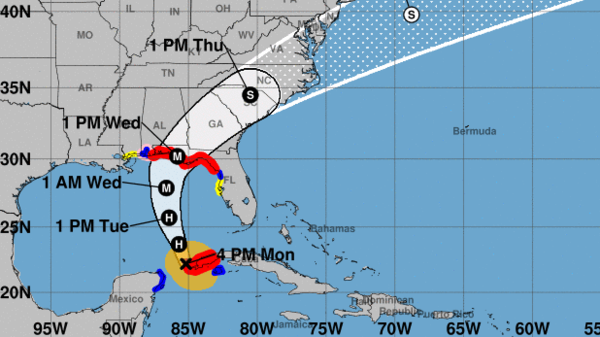 Forecasters say the hurricane will also bring tropical storm conditions to parts of the Yucatan Peninsula, and predict the storm will take a relatively direct northerly route toward the Florida Panhandle. A storm surge warning — meaning dangerous flooding could strike in the next 36 hours — is in effect for a long swath of Florida's coast, from the Okaloosa-Walton county line east of Pensacola to the Anclote River, just north of Tampa Bay. Far inland, from the Florida Panhandle into Georgia and the Carolinas, rainfall totals are predicted to be up to 8 inches, with a foot of rain possible in isolated areas. The hurricane's sustained winds are expected to hit up to 120 mph by late Tuesday, making it a major hurricane — the designation for Category 3 storms and above, on the Saffir-Simpson wind scale. In the storm's wake, the NHC said, "Michael is expected to produce heavy rainfall and flash flooding over portions of western Cuba and the northeastern Yucatan Peninsula of Mexico during the next couple of days." As was the case with recent devastating hurricanes such as Florence and Harvey, forecasters say the biggest dangers for this storm come from the massive amounts of water Michael will bring, in the form of a storm surge and intense rainfall. "Heavy rainfall from Michael could produce life-threatening flash flooding from the Florida Panhandle and Big Bend region into portions of the Carolinas through Thursday," the hurricane center said. Michael has quickly gained strength since the National Weather Service issued its first bulletin on the system Saturday. It became a tropical storm a littler after noon on Sunday; less than 24 hours later, it was a hurricane. Forecasters say the storm will gain more intensity through Tuesday, with a chance it will weaken somewhat as it nears land in Florida. Even if Michael weakens after landfall, the hurricane center says, part of the system will keep circulating over water along the southeastern coast — a situation that will likely help Michael remain a tropical storm for the following 72 hours. After four days, hurricane experts say, the system should diminish and move off the mid-Atlantic coast.